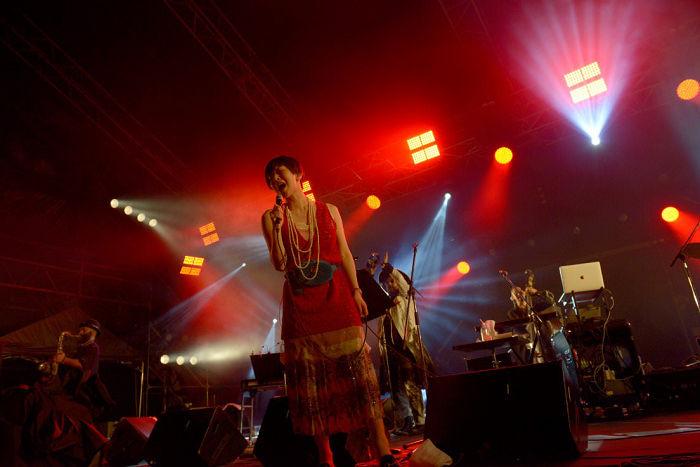 The best thing about Shiina Ringo (to me) is the lives. I think I can keep being grateful for the 434432th rendition of Yokushitsu, and beyond. These patchwork solo albums are disappointing, admittedly. Maybe I'm a sap but even Ringo phoning it in sounds better than 99% of other artists doing the same. I feel like I'm the last holdout on the forums in terms of actually digging her newer output. I already like this style of music so it doesn't take a lot to get me to listen. I do wish she'd release a full solo album though. It's been 4 years since SUNNY and even that was a mix of old and new recordings. The new song isn't bad. It's probably a grower but Ariamaru Tomi it ain't. Do we know which three? Karisome Otome DEATH JAZZ ver. Last edited by chestnutflowers : 2018.10.07 at 06:16 PM. Well, it was a SAPS live after all. It would make zero sense that she performed more than three songs with them, tbh. I read she said she'd perform there solo next year. I dunno I expected more seeing as it was billed on the poster as SAPS x Shiina Ringo, but whatever. It's not bad. I'd rather have something more inspired but it's solid Ringo X Neko commercial work. There's no Neko Saito involved lol. That's the most concerning part of all. Eh, I'll reserve judgement until she actually formally partners with someone on an album or a tour or something substantial...this is a one-off, can't read too much into it. It's entirely possible this was written a while ago too.